The Robo-Lions Rookie season was 2007. Liberty HS student Zach Rubin convinced Liberty HS physics / chemistry teacher Rose Young to start a team at Liberty HS. Zach had previously been involved with a team at the Carroll Career and Technology Center but that proved to be exhausting for all involved since the students had to be bussed back to their home schools and then driven back to the Career and Technology Center. That year the game was “Rack and Roll” and consisted of playing Tic-Tac-Toe with colored inner tubes. The Robo-Lions finished 11th out of 58 teams that first year at the Chesapeake Regional at the United States Naval Academy and made it to the Quarterfinals being edged out by 2 points in the 3rd match. 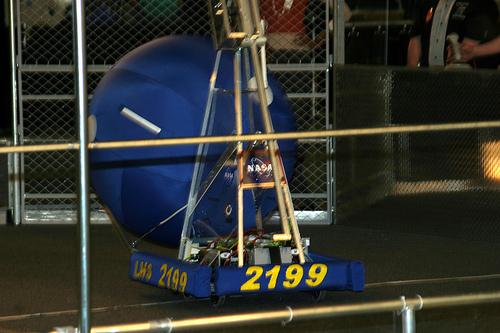 The Robo-Lions also did well in their sophomore year, 2008, finishing 29 out of 60 at Chesapeake playing “Overdrive” which consisted of throwing large medicine balls over high bars while racing around a track, but were not selected for an alliance. 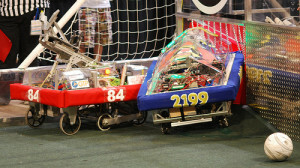 Their third year 2009 started an amazing streak of success for Team 2199 by winning their first Regional Award, the General Motors Industrial Design Award, as well as leading the Finalist Alliance at Chesapeake, taking the Finals to an epic 3rd match while playing “Lunacy”, a game which celebrated the Apollo Moon landing. Lunacy involved a low friction field to simulate lunar gravity and obliged robots to pick up lightweight space balls and dump them in their alliance partners trailing wagon. This followed on the heels of a Week 1 Semifinals appearance at the Washington DC Regional. 2009 was also the first year that the Blue and Gold attended two Regional Competitions. 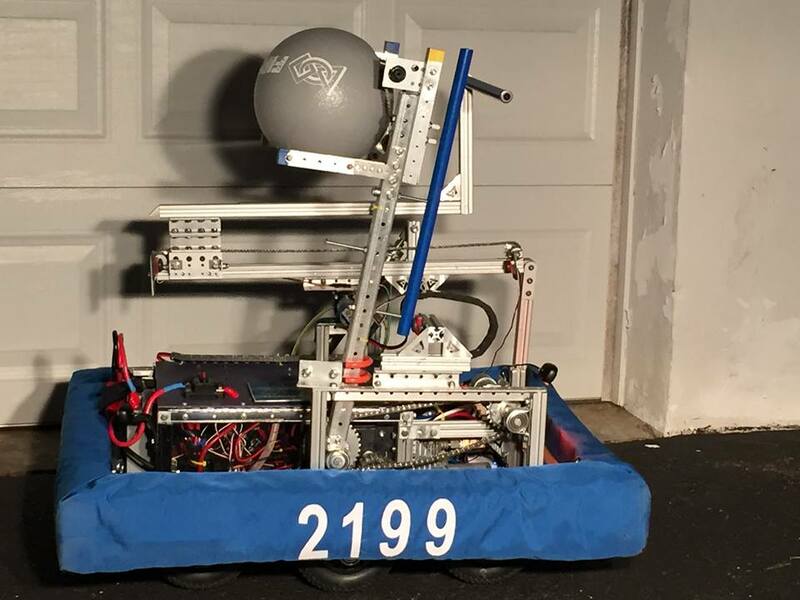 A new tradition was started in 2009 with the robot being named after the outstanding rookie / freshman / middle school team member. The robot was named the Preston Fuller Junior. 2009 Robot Preston Fuller Jr. 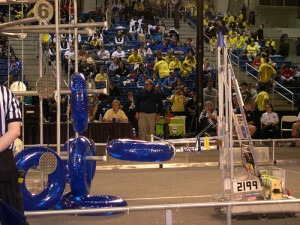 The winning ways continued in 2010 with the Lions making the semifinals at the Chesapeake Regional, held at the Baltimore Convention Center for the first time playing “Breakaway”, a soccer game with multiple goals, huge humps in the field and an optional robot chin up for extra points. Junior Captain Katie Miles was selected as a Dean’s List Finalist and attended the FIRST Championships in St. Louis. Team 2199 followed up by winning the UL Safety Award at the Philadelphia Regional due to excellent preparation by Safety Captain KC Elliott. The driver was Johnathan Mayo. The Senior Captain was Nick Canada and the Junior Captain was Katie Miles. The robot was named the KC Elliott Junior. 2010 Robot KC Elliott Jr.
2011 was a banner year with the Robo-Lions winning the Engineering Inspiration Award at the New Jersey Regional in historic Trenton, NJ (site of Washington’s famous crossing of the Delaware) and earning their first bid to the FIRST Championships as a team. 2199 finished 22nd out of 60 and made the Quarterfinals playing “Logomotion” in Trenton. Logomotion was Rack and Roll on steroids. The tubes were Red, Blue, and White and were square, triangular, and circular to match the FIRST logo (which celebrates the solid volumes used in Archimedes’ classical “bath-tub” experiment). A yellow tube was hung in the 15 second autonomous period. At the end of the match the big robots ejected smaller “minibots” made out of FTC parts which raced to the top of steel poles for extra points. 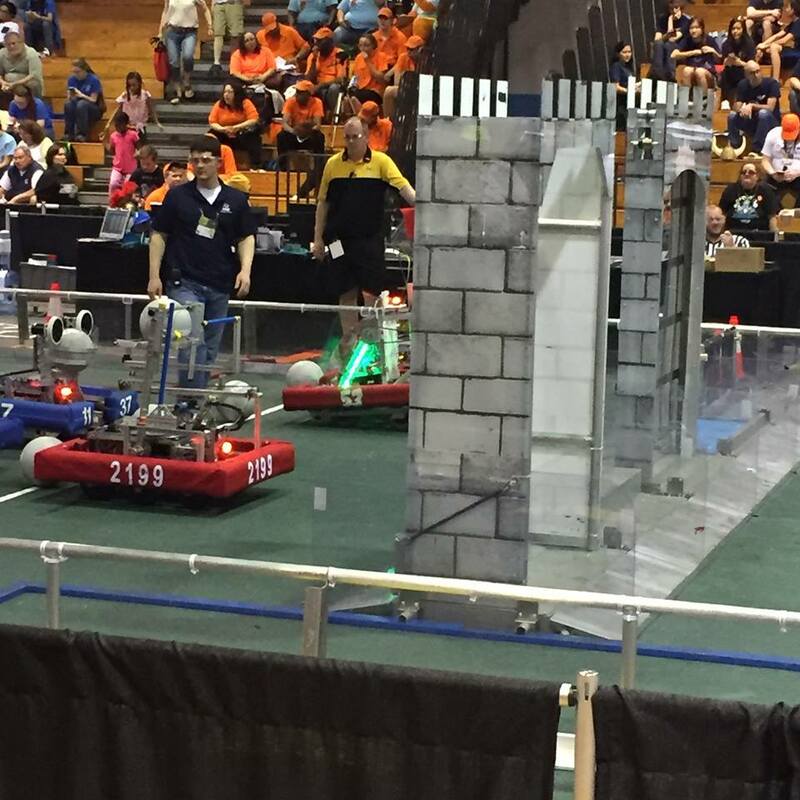 The Blue and Gold went on to finish 18 out of 60 teams at the Chesapeake Regional and made it to the Quarterfinals. Junior Alex Bratchie, webmaster and wiring lead was one of the Dean’s List finalists making back to back selections for 2199. The team really enjoyed their trip to the FIRST Championships but weren’t as competitive as they’d like finishing 2-8. 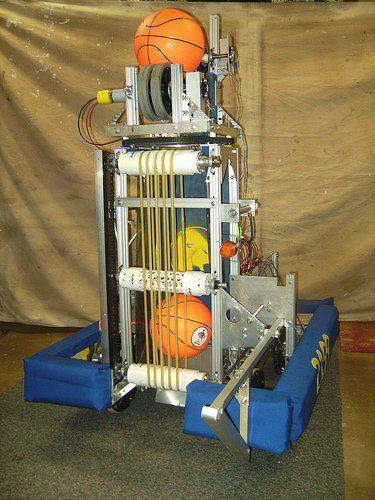 The Robo-Lions instituted modular design in 2011 and added an improved three stage elevator at the FIRST Championships that extended to 14′ high. Unfortunately this was not utilized correctly and tubes were hung horizontally rather than vertically as intended. The latter problem was fixed at the Battle O’ Baltimore (BOB) Off-Season event with driver Connor Cole and hanger Preston Fuller taking 2199 to their first BOB victory. This was followed up with a Finalist finish at Ramp Riot in Ambler, PA as the Lions and their alliance partners bested alliances led by the formidable Team 341 Miss Daisy and Team 365 MOE, both Hall of Fame teams, only to be edged in the finals by Team 2016 Might Monkey Wrenches who lead the Finalist Alliance at the Championships. 2011 was also a tumultuous year with the Lions losing their space in the old London Fog warehouse right after Championships. Travel costs were also expensive ($10,000 for FIRST Championships alone) with Carroll County Public Schools instituting a requirement to have bonded licensed transportation services for all student teams and clubs. Additionally lead mentor Rose Young decided to leave Liberty HS for better opportunities elsewhere. This lead to the creation of the 501(c)(3) not for profit “Partnership and Inspiration for Engineering Education and Entrepreneurship”, or PIE3 (http://www.pie-3.org) for short, to insure continuity of the team regardless of external circumstances. PIE3 also affiliated with Carroll County Parks and Recreation through the local Freedom Area Recreation Council (FARC, http://www.freedomarearec.com/) which provided liability insurance and didn’t require bonded and licensed transportation, so team parents could drive team members to competitions saving the Lions a lot of money that could be plowed back into the robotics program. 2011 was also the year that the team standardized on bolt sizes selecting 1/4-20 and #10-32 as standard sizes. Related tools such as hex keys, sockets, or drills were color coded blue or gold to ease identification. The drive team was Johnathan Mayo and Connor Cole. The robot was named the Abi Fuller Junior. The Senior Captain was Katie Miles and the Junior Captain was Preston Fuller. 2011 Robot Abi Fuller Jr.
2012 followed strong with 2199 finishing 10th after qualifications and making it to the Quarterfinals at Chesapeake playing “Rebound Rumble”, a game which required robots to shoot Nerf basketballs into nets of varying heights and then balance up to 3 robots on a teter-toter bridge. Public Relations Chair Matt Wesloh’s hard work with his Uncle Jim, entepreneur and owner of PROCAS (http://procas.com/), on the team’s business plan, led to 2199’s first Entrepreneurship Award at the Queen City Regional in Cincinnati, Ohio. 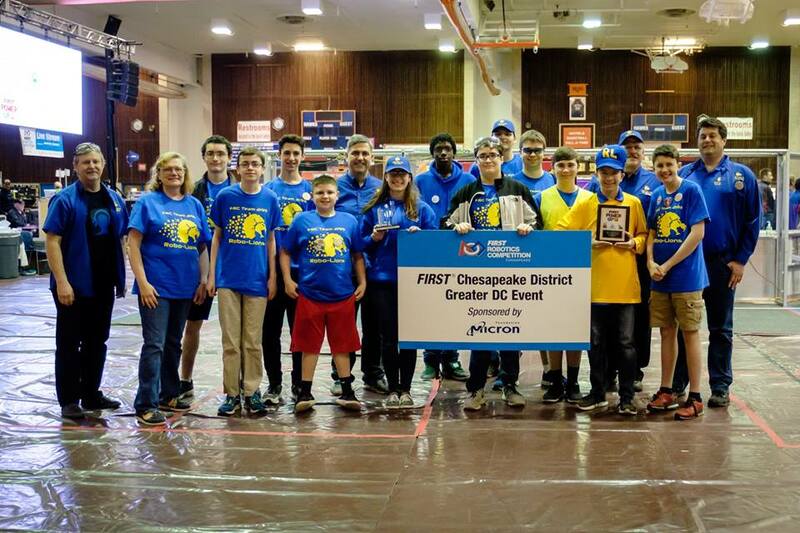 The year finished strong with the Lions winning their 2nd straight BOB Championship along with Baltimore Area Alliance partners team 888 Robotiators of Glenelg HS and team 4067 The Incredible Hawk of River Hill HS. 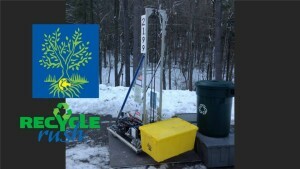 2012 was also the first year the Lions executed closed loop control using the video camera and SuperBright blue LED lights to steer the robot to the middle basket which had reflective tape on it and reflected the blue LED light back to the camera. The drive team consisted of Juniors Connor Cole and KC Elliott, with human player Abi Fuller. The robot was named the Elizabeth Dumm Junior. The senior captain was Preston Fuller, the junior captain was Connor Cole. 2012 Robot Amanda Dumm Jr.
2013 was a magic year for the Robo-Lions, and the game was “Ultimate Ascent”. The robots shot ultimate frisbees into goals 7-9 feet high from as far away as 50 feet. 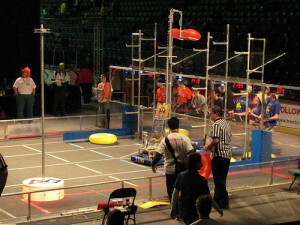 At the end of the match the robots would climb a jungle gym type apparatus up one, two, or three levels, a level at a time. 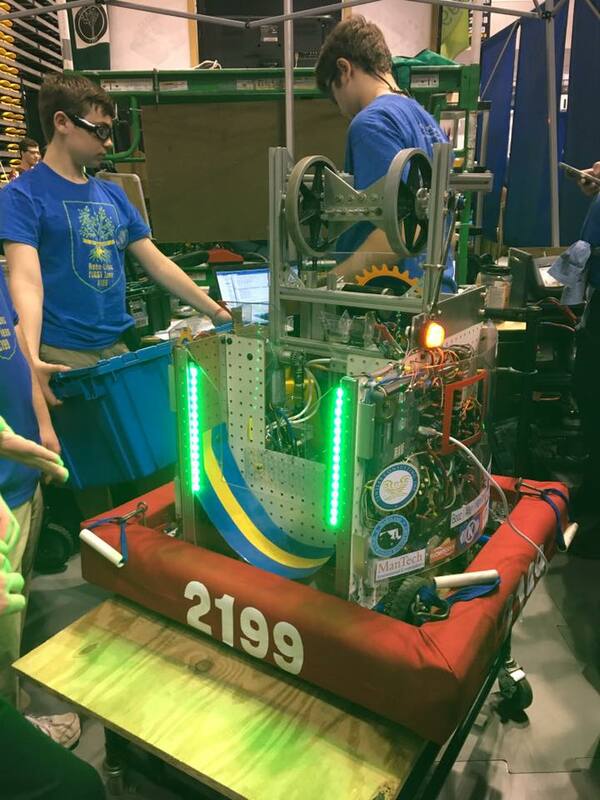 2199 won their second Entrepreneurship Award at the Virginia Regional in Richmond at Virginia Commonwealth University finishing 26 out of 64, despite being hampered by radio problems. 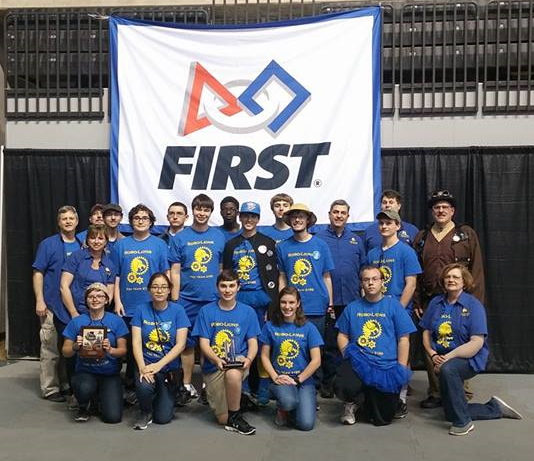 All the cumulative hard work on robotics and outreach finally paid off as the Blue and Gold won the Chairman’s Award at the Chesapeake Regional in Baltimore, FIRST Robotics highest Regional Award, which earned them their 2nd berth to the FIRST Championships. The winning Chairman’s presentation team included Captain Matt Wesloh, PR Chair Bridget Doyle, and PR team member Coralie Milnes (a freshman!). The Lions finished 11th out of 64 and made the Quarterfinals. They made a splash at the FIRST Championships at one point being in 1st place on Galileo Field (which produced the Champions!) and finishing 33 out of 100 teams. The drive team consisted of seniors Connor Cole and KC Elliott with human player freshman John Schopman. The robot was named the John Schopman Jr. The Senior Captain was Matt Wesloh and the Junior Captain Abi Fuller. 2014 looked to be a tough year with 7 seniors graduating in 2013 but the Robo-Lions continued the winning tradition with a majority underclassmen team (and most of them freshman!) led by Senior Captains Mikey Walton and Abi Fuller. 2199 won their first Team Spirit Award at the Crossroads Regional in Terre Haute, Indiana thanks to the underclassperson presentation team of Coralie M. (sophomore) and Jude F. (8th grader) and Abi Fuller’s outstanding collection of Safety Haiku buttons. 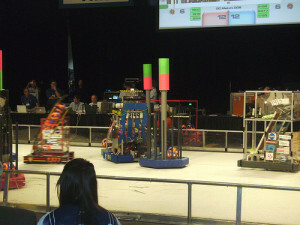 The team got to play robots in a simulated match prior to the start of elimination rounds. 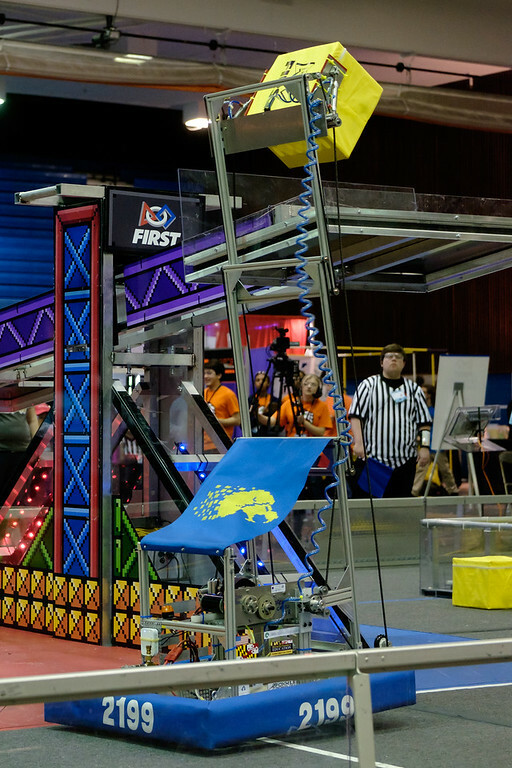 The robot took a beating in Indiana with numerous breakdowns playing Aerial Assist, a game involving throwing a medicine ball over a central fence, so it is handled by all your alliance partners and then shooting it into a far goal 8.5 feet high. The Lions roared back at Chesapeake, which moved to the University of Maryland’s Comcast Center for the first time, finishing 21st out of 54 teams and making the Quarterfinals. Drivers were sophomore Matt O. and freshman Chris M., with human player Jude F. ably assisting. The robot was named the Bobby Eissele Junior. 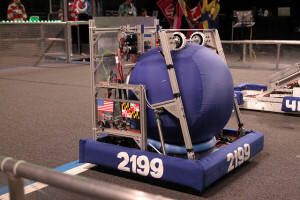 With no real Seniors on the 2015 team it looked to be a tough year and the Robo-Lions had a rough outing at the Chesapeake Regional but roared back with a Semifinal appearance at the Battle O’ Baltimore with alliance lead Team 1629 GACO from Garrett County and Team 4067 The Incredible Hawk. The Robot was named the Josh 3.0. With true Senior Class leadership in place, the Robo-Lions roared back in 2016 playing FIRST Stronghold. This was also the first year of the Chesapeake District which combined the former Chesapeake (Maryland), DC, and Virginia Regions. Teams competed at two District events for the price of a single regional with the hopes of amassing enough qualifying points to qualify for the District Championship. 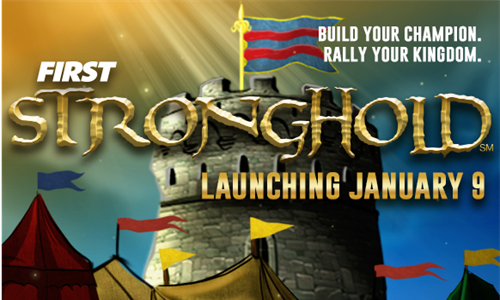 FIRST Stronghold was a Knights and Castles themed game involving two key elements. 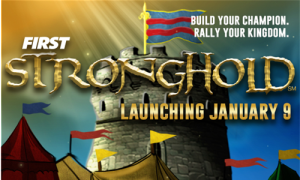 The first element involved breaching the opposition alliances outer defenses which included a drawbridge, portcullis, cheval de frees, sally port, irregular terrain, rock wall, moat, ramps, and low bar. The second phase involved carrying “boulders” (rubberized nerf balls) across the defenses to be shot into the opponents castle. Boulders could be shot into a low goal (2 points) or a high goal (5 points). When 8 “boulders” were shot into the castle it becomes fatally weakened allowing capture by surrounding it with all three of your alliances robots. Additional points could be gained by scaling the opponents castle. The Robo-Lions played in two District Events in 2016. At the DC District qualifying event the Robo-Lions finished ranked 14 and were picked for the 7th seeded alliance which took the 2nd seeded alliance to three matches before being eliminated. The Robo-Lions also won the prestigious Engineering Inspiration Award at the DC event, in recognition of their outstanding Outreach programs. 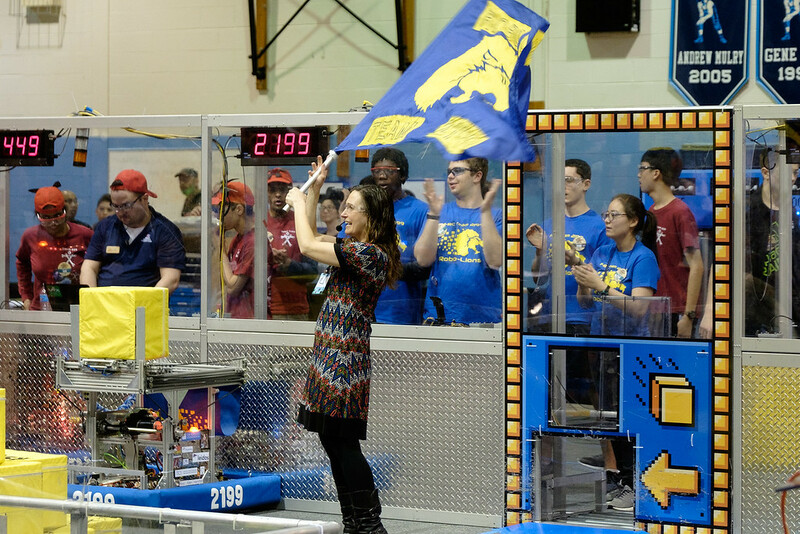 The Robo-Lions fell victim to an unfortunate series of events at the Central Maryland District qualifier event but rallied back with two strong wins to move to rank 25. Although they did not get picked for an alliance they didn’t go home empty handed winning the Entrepreneurship Award for their outstanding Business Plan and execution of their vision. The Robo-Lions rallied back at Battle O’ Baltimore leading the 5th Seeded Alliance to a Semifinal berth before losing to the eventual winning alliance. Team Captains were Matt O’Connell and John Schopman and the PR Chair was Coralie Milnes. 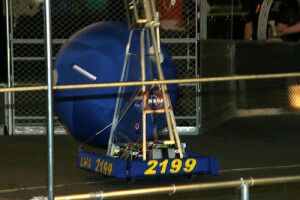 The robot was the Nathandrew, named after the two outstanding freshman on the build team Nathan D. and Andrew B. Drivers were Josh M. and Nathan D., Coach was Matt O’Connell. Build Captain was Bobbie E.
The Nathandrew ready for Battle at the Workshop! With another strong senior class in place, including several 4-year veterans, the Robo-Lions had a great 2017! The game was Steamworks which was a “Steam-Punk” themed game hearkening to Industrial Age steam powered devices. Robots picked up large yellow gears from feeder stations or the floor and delivered them to pegs on a “Steam Powered” airship. Students on the airship pulled the gears up onto the airship and placed them on gear trains in order to turn “rotors”, up to 4 in all. Robots could also pick up fuel (large yellow whiffle balls) and place it into a steam boiler. Finally at the end of the match robots climber up team devised ropes to the airship to be ready for flight. The Robo-Lions were 6-6-0 and ranked 22 at the Northern Virginia Qualifier but didn’t get picked due to an inability to successfully climb. The Robo-Lions were not to be denied a medal; however, winning the Engineering Inspiration Award for their outstanding outreach program. The Lions roared back at the Northern Maryland qualifier with a new super-fast climbing mechanism. They had a 13-5-1 record in qualifiers and were ranked 2. The led the #2 alliance to the finals barely losing to the #1 alliance and earning Finalist medals. Robo-Lions are Finalists at Northern Maryland Qualifier! 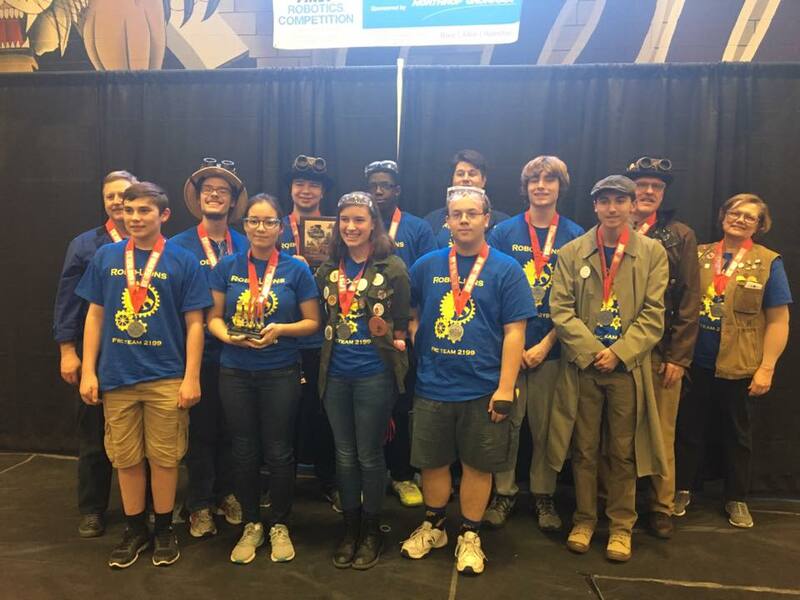 With the Finalist finish in Northern Maryland the Robo-Lions qualified for the Chesapeake District Championship in Richmond Virginia at Virginia Commonwealth University. 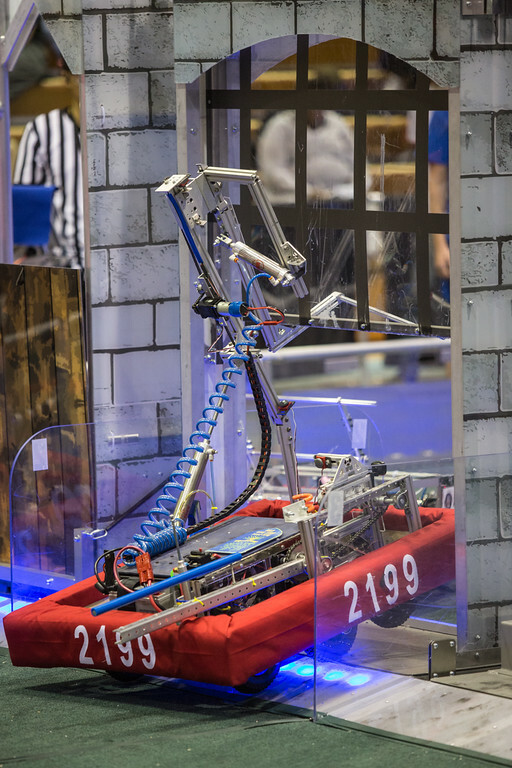 The competition was fierce in Richmond with numerous teams going on to the Championship in Detroit and performing spectacularly including the Championship winner Sparky 384. The Robo-Lions performed well despite the win-loss record and did not miss a climb in qualifiers. Again despite not being picked by an alliance for eliminations the Robo-Lions were not to be denied earning their first Judge’s award for their outreach program and Robot Assistive Rover (RoAR). 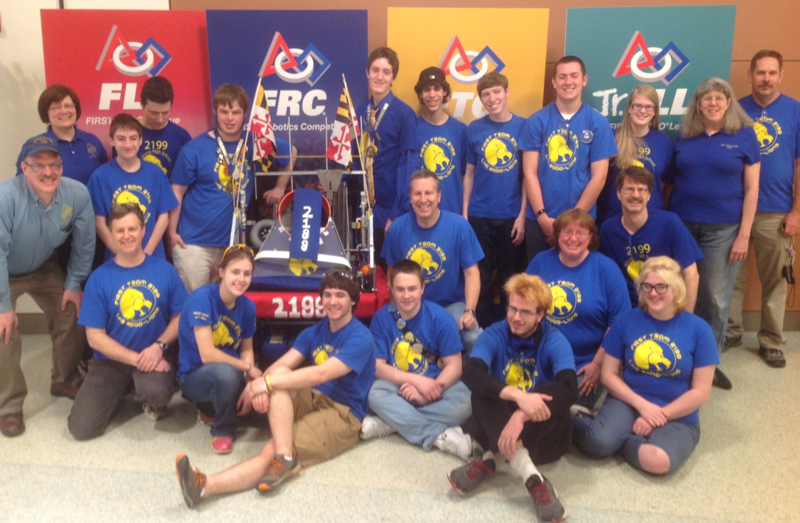 The Robo-Lions were also Quarterfinalists at the Battle O’ Baltimore. The Team Captain was Bobby Eissele, the PR Chair was Shannon Eissele, and the robot was the Ben Hroblak Junior. In 2018 FIRST decided to introduce a game harking back to early 8-bit video games with their pixellated characters and objects. It was called “Power Up” and featured yellow cubes which were stacked on a series of teter-toter devices of low and high height. The alliance who had enough stacked cubes to get the teter-toter to tilt in their direction would begin accumulating 1 point per second. Points were also available by placing up to 9 blocks in a tic-tac-toe like structure with three separate columns. Team players could hit a button on top of each column to take control of their opponents teter-toter or double their score for 15 seconds or qualify for a robot climbs. Robots could climb in the last 30 seconds of the match for extra points. The Robo-Lions followed a disciplined process of game strategy analysis, requirements development, and allocation of requirements to subsystems prior to subsystem design and system integration. Their overall design included mecanum drive for maneuverability and precise positioning, a piston driven cube gripper, and a 3 stage double tower chain driven elevator. The Robo-Lions did well at all 3 District Events they attended. At the Greater DC Qualifying Event they were ranked 13th at the end of Qualification Matches and led the 8th seeded alliance to the Quarterfinals. They capped the event by winning the Entrepreneurship Award. 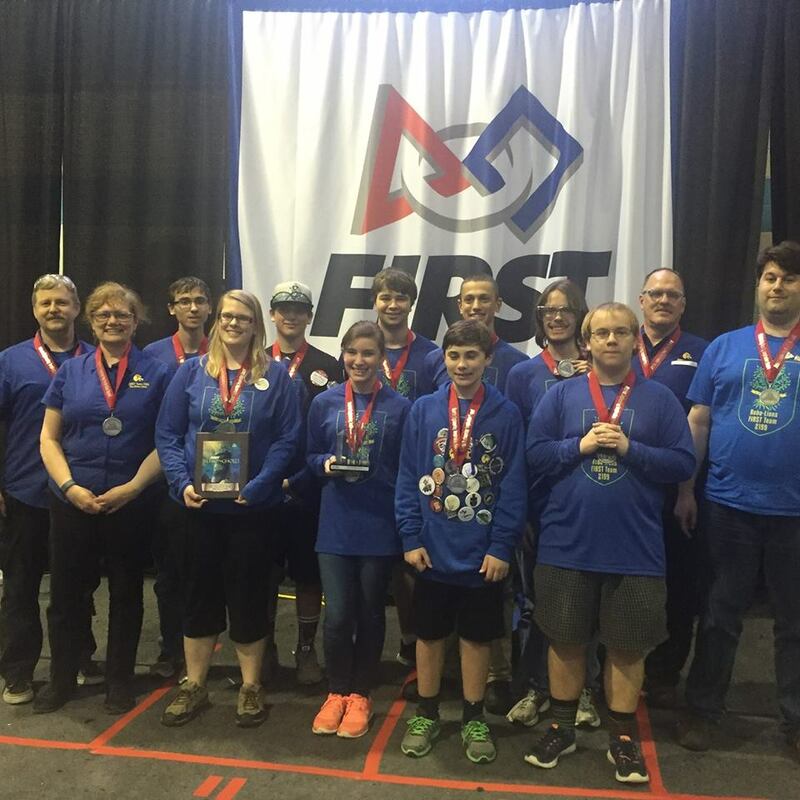 At the Central Maryland District Qualifier the Robo-Lions introduced an improved pneumatic grabber and it paid off with an 8-6-0 record leading the 7th ranked alliance to the Quarterfinals. 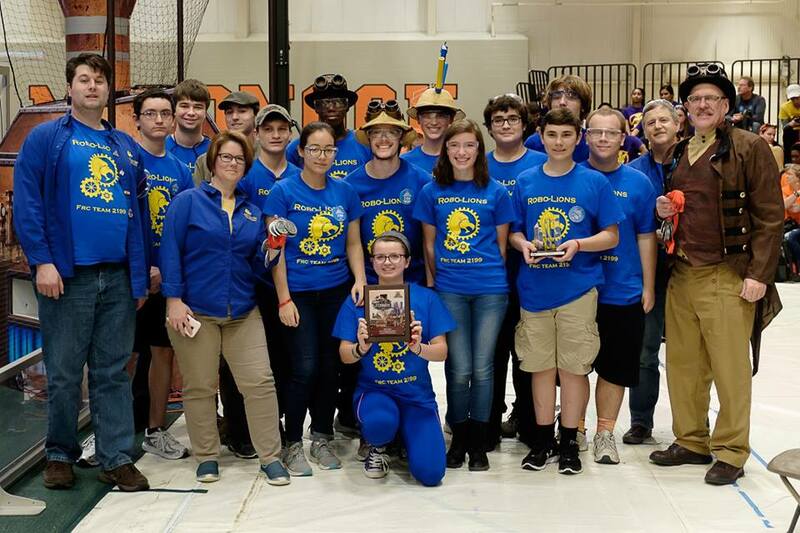 With outstanding results in their two qualifiers the Robo-Lions advanced the Chesapeake District Finals. In a tight fought competition the Lions finished 6-6-0 and Ranked 24th but were not selected for an alliance. Support Carroll County K-12 Student Robotics! ADA Statement The Americans with Disabilities Act applies to the Carroll County Government and its programs, services, activities, and facilities. Anyone requiring an auxiliary aid or service for effective communication or who has a complaint should contact The Department of Citizen Services, 410.386.3600 or 1.888.302.8978 or MD Relay 7-1-1/1.800.735.2258 as soon as possible but no later than 72 hours before the scheduled event.